June 15, 2018, 11:09 AM · How can a violist or violinist achieve a pain-free set-up? 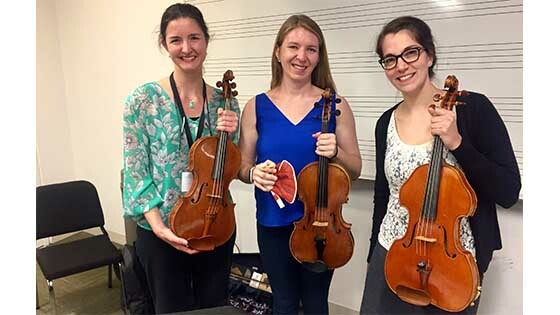 This difficult issue was the topic of a panel discussion by violists Christiana Reader, Kayleigh Miller (founder of the Musicians Health Collective blog) and Daphne Gerling on Wednesday at the American Viola Society Festival at the Colburn School. Sitting behind two tables that were covered in dozens of different kinds of chin rests and shoulder rests, they talked about how to address both one's basic posture and also how to choose the right amount of height in a chin rest and shoulder rest combination. "Making something comfortable in the short-term doesn't mean it will be comfortable in the long-term," Reader said. It may not even be comfortable after you leave the room -- Gerling described a high-sitting and well-sculpted shoulder rest that looked great and felt great when she tried it on, but then after a few minutes of actual playing she realized that it did not allow for the mobility that she needed. And it's not just the fact that a shoulder or chin rest may work in one situation and not another -- another issue is that the body changes over time. "The way your body is today is not necessarily the way it will be in 10 years," Miller said. "The body can change, month-to-month, year-to-year." That means that a setup that works perfectly for three years may suddenly start to feel painful or imbalanced, requiring a reevaluation and new solutions. Add to this the fact that "there is no one set-up that works for everyone," Miller said, because people have a different slope to their collarbones, curvature in their shoulders, length of neck and shape of jawbone. It's no wonder that there are so many different designs of shoulder and chin rests to help us cope with all of this. But how do you choose the right one? And how do you know, if you have been playing with the wrong one? Basically speaking, violists and violinists tend to have two main kinds of problems with their set up: they are either "under set-up," without enough height to help create a proper position, or "over set-up," with too much height. This can occur when a student or player has a flat, low chin rest. One can see that the player is hunched over, with a curved neck and a lot of clenching as he or she looks for security. The left hand will tire more easily, vibrato is more difficult, and the player tends to experience neck pain. Miller gave us the medical name for this hunched-over phenomenon: "kyphosis." The solution for this is to build some height, but be sure to balance it from above and below. Changing the height of the shoulder rest affects left-hand positioning, so one may want to look to the chin rest for more height, and also consider whether the chin rest is placed in the middle or to the side, the comfort which will vary with every person. In this scenario, everything is too high, and this takes away a person's mobility, as the instrument is completely stuck in place. Symptoms of this: sometimes you'll see a space between the instrument and the chin, a detachment from the instrument because it has stopped resting on the collar bone. Most often the solution is less height from below, i.e. less height from the shoulder rest. It's also important to consider the shape of one's shoulders and choose a chinrest and shoulder rest accordingly. Things like the Kreddle chinrest, which is adjustable, can be good for narrow shoulders. Excess weight -- of the instrument itself and/or its attachments such as the chin rest and shoulder rest -- can also cause positioning problems. If your instrument is already heavy, you might think twice about a heavy wooden shoulder rest. Another issue is simply how one places the instrument on the shoulder. Sometimes violists and violinists hold their instrument either too far to the right or to the left, which puts the shoulder socket into a stressed position. This can also happen with holding the instrument too high. The problem with this is that the shoulder actually does not have a lot of attachment to the body, Miller explained, giving it more potential for displacement and injury. In fact, most of the shoulder mechanism is held together with soft tissue, muscle and ligament - there is no bone holding it together. As demonstrated in the video above: First you relax your arms by your side and shake out your hands. Then you flip your forearms out, into a position we generally associate with asking a question. Then you turn over the right forearm and slightly raise the left arm (but not too much! ), and that tends to be a natural playing position. "The more you deviate from the natural way your body wants to be, the more your body is going to get tired with what you are doing," Gerling said. Then there is the placement of everything else. "It starts with a supportive and engaged torso," Reader said. The collar bone provides stability, and the head provides a counter-balance. If the shoulders are rolled too far forward, this can affect the way muscles function and cause the development of both weakness and pain. Make sure the fingers move from the base knuckles, the thumb is mobile and not stuck; the wrist does not protrude. The elbow should support the left hand in moving from string to string, coming under to reach the lower strings. "I don't believe the thumb has a perfect place where it lives," Reader said, noting that in viola playing especially, the thumb needs the option of being placed a little farther forward, and the wrist needs the option of collapsing in slightly, to allow for the wider finger placement that is required by the viola's larger size. If you are going to make changes to your set-up, make sure to do it in a deliberate way. "Any changes in set-up need to happen gradually," Gerling said. If you are trying a new shoulder rest or chin rest, be sure to test it in various settings: in rehearsal, in performance, in the practice room. The body can change, when under the stress of a performance, and your set-up has to support that scenario as well as a low-stress practice session. Sometimes people fall into the trap of thinking that "by getting an expensive shoulder rest, it will solve their problems in five minutes," Gerling said. Sometimes the problem isn't your setup; it's your own basic posture, muscle strength and overall wellness. If you are starting with bad posture, weak muscles and a lot of stress, then buying an expensive shoulder rest and changing your setup will not solve the problem. A few non-setup solutions that you might consider include exercise such as pilates, Tai Chi or yoga, exercises athat both strengthen and stretch muscles while calming the mind. Be sure to incorporate warming up in your practicing, approaching your instrument in a slow way each time you start. Frequent massage with a qualified therapist that works well for many people. After all, in many ways we are athletes! Sleep well, eat right, maintain health. Also, if you are practicing for long periods of time, keep in mind that "no one can have good posture for two and a half hours," Gerling said. Go for 20 minutes, then take a break. For teachers, "create health instead of injury," Gerling said. Good advice for us all! June 15, 2018 at 07:37 PM · Nice! Always good to have more focus on setup and body positioning. June 15, 2018 at 07:48 PM · It's interesting to me that in the photo of the presenters in this panel discussion, all three have chosen chinrests that are essentially centered over the tailpiece. I'm assuming those are their own instruments. I think there's a lesson right there, and I try not to be dogmatic about it but I'd urge everyone who hasn't switched to a centered chinrest to give one a try. Take time to observe how many players, possibly including yourself, place their chin on the tailpiece when using left side chinrests like a Guarneri, to name one example. I have three violins, two acoustics and a Yamaha YEV electric, and I've put Wittner "Augsburg" chinrests on all of them. They're adjustable in height and tilt, the cup is amazingly comfortable in my opinion, they're extremely lightweight, hypoallergenic, won't absorb perspiration or harbor bacteria, and they're cheap to buy. I was reluctant to switch to the Augsburg because of some misplaced aesthetic notion of not wanting plastic on my violins, and a feeling that because my acoustic violins were set up with boxwood and rosewood respectively, that the chinrests should therefore match. I put the Augsburg on my YEV first, and quickly realized that it was the one I needed on my acoustics as well. Comfort and practicality overruled misguided and meaningless aesthetics. By the way, you pronounce Wittner "Vittner," like Richard Wagner is "Vaagner." Impress your luthier (pronounced loot-ee-er in American English) when you go to buy one by pronouncing it correctly! June 15, 2018 at 08:45 PM · That’s great information to know, thanks Mark! June 15, 2018 at 10:34 PM · You certainly see a lot of violists using a centred chinrest, and I've started thinking about switching to one as well on my 16.5 inch viola. June 15, 2018 at 11:25 PM · Even more than equipment or lack of equipment to position the instrument comfortably, I find that I mostly experience pain when there is an imbalance between the right hand and the left hand. If my strings are old and have lost their spring, I tend to compensate with my bow arm, and that eventually translates into pain. If my bow needs a rehair, I tend to try and compensate for that by over exerting my left hand, and that gets me in trouble. I know that I'm not the only person who puts off changing strings and getting my bows rehaired! I also play with a center chin rest and without a shoulder rest, and though it takes a certain amount of time to build up the necessary left bicep muscles to keep the arm up and comfortable for long periods of time, it rarely causes me pain, unless I'm playing really long orchestral pieces. I also find that different bows cause different levels of comfort/discomfort in my left hand. June 16, 2018 at 02:02 PM · @Mark, if you watch a lot of pro players who are using Guarneri chin rests, they are effectively using the "knob" of the rest (the part that goes over the tail piece) as their de facto chin rest and the "cup" part of the rest goes unused. Joshua Bell is an example but there are many others. June 17, 2018 at 12:07 AM · Lots of great things said in this article. Just note that neck pain can occur whether your setup is too high or too low. It is also important to note whether your instrument sits properly on your body or not, as bad setup can result in your instrument putting pressure on the wrong part of your body. Plus, shoulder rest placement matters a lot too. Placement can make a huge difference in your comfort level. I have found that even the angles of the feet and the width of the rest make a huge difference as well. I once read somewhere that violists tend to have a stronger preference for a center-mounted chin rest due to the width of the viola and the need to balance it properly. While that is true, my personal thinking is that due to the length of the viola, most players need to hold it quite far to the right, often dictating an over-the-tailpiece placement. For me personally, a center-mounted chin rest is a "must" for me on viola. A side mounted chin rest will work for me on violin if it has a small portion over the tailpiece, however, although I actually use a center mounted chin rest on violin because that was my specific preference earlier on in life. Guarneri chin rests, which you might think fits my description of side mounted and portion over tailpiece, doesn't work for me because the cross piece doesn't fit my chin shape. Using the cross-over piece as the chin area will work for some people, but not others. June 18, 2018 at 08:49 PM · Thank you all. An interesting review on a subject that is a problem for mot of us. For me it has increased with age.